My Contribution – The sale of the 2013 colt benefited the American Quarter Horse Foundation. The money from the sale of My Contribution will help pave the way for better equine health and strong leaders in the equine industry. 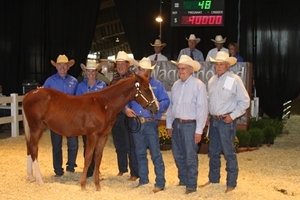 The 2013 American Quarter Horse weanling My Contribution (WR This Cats Smart-Dash Back To Me by Dash For Cash), was purchased on Saturday, September 7, by Art Nicholas, AQHA First Vice President Johnny Trotter, Mike Ingram and Burnett Ranches for $40,000. The colt, with outstanding cow horse and racing bloodlines, was sold during the Wagonhound Land & Livestock sale in Douglas, Wyoming. All proceeds from the sale benefitted the American Quarter Horse Foundation. “Being given the proceeds from My Contribution is a generous gift. We can’t thank the Trotters, the Nicholases, the Ingrams and Burnett Ranches enough for purchasing this colt,” said Chris Sitz, senior director of the Foundation. Any gift to the Foundation is a blessing, but a gift of this magnitude provides so much assistance to the programs the Foundation supports. The Foundation seeks to advance the American Quarter Horse and the partnership it shares with man through the development of funds. This contribution will support equine research to ensure the health and well-being of horses, scholarships to support higher educational opportunities for the equine industry’s youth, America’s Horse Cares to pair individuals with disabilities with horses and the American Quarter Horse Hall of Fame & Museum to preserve the rich history of the breed. To learn more about the Foundation and ways to contribute, visit www.aqha.com/foundation.